MARTIN MCGUINNESS HAS said that he disagrees with the “perverse” ruling of a court in Mauritius to acquit the two men who were accused of the murder of Michaela McAreavey. The North’s deputy first minister said that he disagreed with the verdict of the jury in the case and was meeting with the Mauritian high commissioner in London today to express his concerns with a view to having a retrial taking place. “There are huge question marks over how the policing authorities in Mauritius handled this investigation from the beginning,” he told RTÉ’s Morning Ireland. Two former attendants at a hotel on the Indian Ocean island were last week acquitted of the murder of the Tyrone woman in January last year. There has been considerable criticism of judicial process in Mauritius as well as outrage at the publication of graphic images of Michaela’s body in one of the island’s Sunday newspapers. McGuinness said the purpose of his meeting with authorities in London was to discuss the “appalling handling of the case and the appalling way” that the McAreavey and Harte families were treated throughout the case. “I want to hear from the Mauritians what exactly they are doing about that,” he said. I would be happy with a further investigation with a view to ensuring that there is a retrial and that’s what the main focus has to be. McGuinness said that there had been agreement on the idea that both the Gardaí and the Police Service of Northern Ireland contribute to a review of the evidence in the case and said that “it all has to be done with a view to a retrial”. He was speaking as the editor of the Sunday Times newspaper, which published the graphic photos of McAreavey’s body, prepares to go before a court in Port Louis today where he is expected to be charged with ouraging religious and public morality. 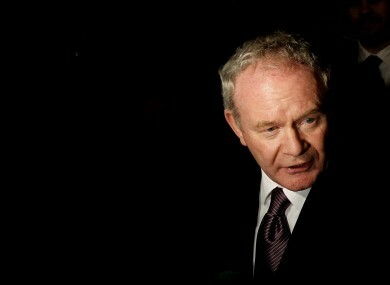 McGuinness said that that the publication of the images was “absolutely distasteful” and described the Sunday publication as a “rag of a newspaper”. He also said that he had not seen the controversial images of McAreavey and the hotel room where she was killed. Email “Martin McGuinness disagrees with 'perverse' Michaela trial verdict ”. Feedback on “Martin McGuinness disagrees with 'perverse' Michaela trial verdict ”.